Produktinformationen "TEENAGE MUTANT NINJA TURTLES LEONARDO 1/4 SCALE ACTIONFIGUR"
Radical, dudes! NECA's third 1/4-scale action figure from the 1990 Teenage Mutant Ninja Turtles movie is Leonardo, the leader of the Turtles. No one works, studies or trains harder than Leonardo. He has the respect of his brothers, and leads by example, not by giving orders. Leonardo stands 16.5" tall and features 30 points of articulation, including double elbow joints, to fully showcase his stealthy moves. 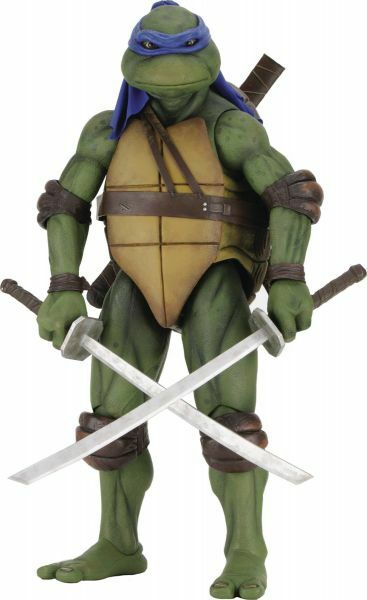 The figure is highly detailed and entirely accurate to the movie, and comes with katana accessories that fit in scabbards on the back of his shell, unbroken mutagen canister, slice of pizza (no anchovies) and interchangeable hands. Weiterführende Links zu "TEENAGE MUTANT NINJA TURTLES LEONARDO 1/4 SCALE ACTIONFIGUR"
Kundenbewertungen für "TEENAGE MUTANT NINJA TURTLES LEONARDO 1/4 SCALE ACTIONFIGUR"